Let me start in the backyard. This area was never landscaped. It was evidently bulldozed. When I first moved in, I asked the builder to put bark on the ground to prevent the dogs from tracking mud into the house. He put down wood chips, not bark. Little by little, "weeds" made their way through the chips, mostly false dandelions and creeping buttercups. 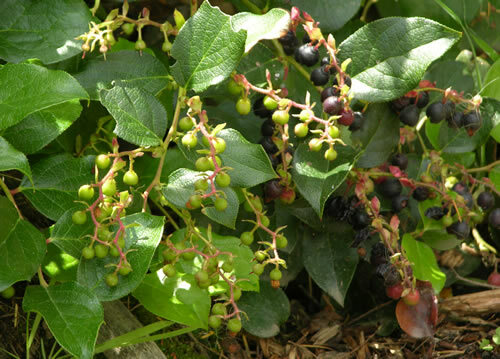 Later, some salal plants and huckleberries established themselves in a couple of places. This southwest corner is mostly shady because of the overhang of the neighbor's tree (and a few of mine.) 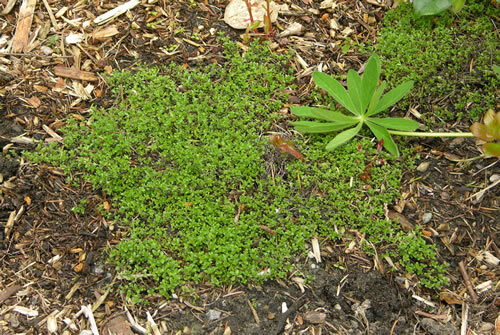 The ground is often extremely wet and the feet can sometimes sink several inches, even 6-8 inches. for ones that are almost ready to harvest. 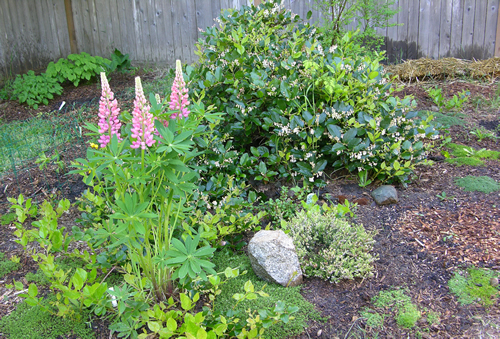 Starting with what "is", I decided to expand around the most viable area of the backyard, adding compost and mulch. This area was used as a nursery for plants that might be moved later. 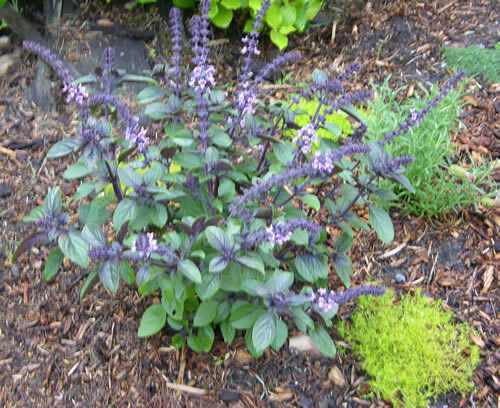 It was also used for bee plants, most of which, in my climate zone, were annuals, like the African purple basil. See where it was planted on the photo above -- lots of sun! 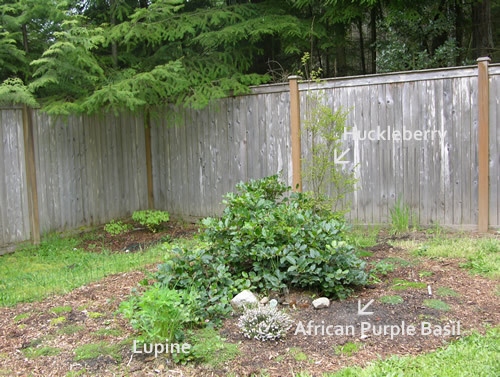 Lupine is a legume and is nitrogen fixing. 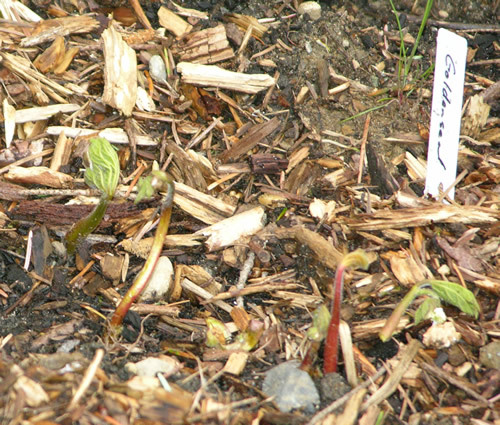 This year, thanks to the generosity of Kathrin Woodlyn Bateman, I added goldenseal to the back of salal area, a spot that would get some sun but quite a bit of shade. Next, we'll look at the other corner of the backyard. Keep in mind that this is an ongoing project involving minimal disturbance of what is natural. 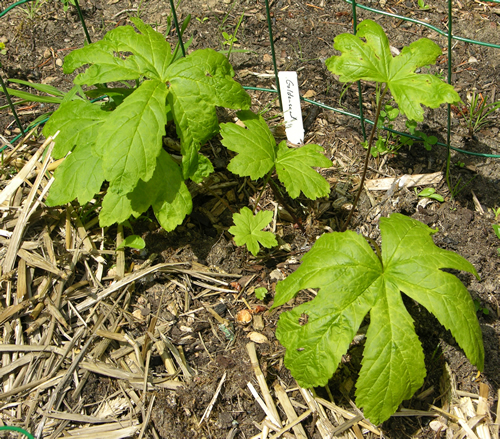 One of the tenets of permaculture is that a mixture of brightly flowering plants and edible or medicinal plants is crucial to garden health. Insects are attracted by the flowers and leave the food alone.